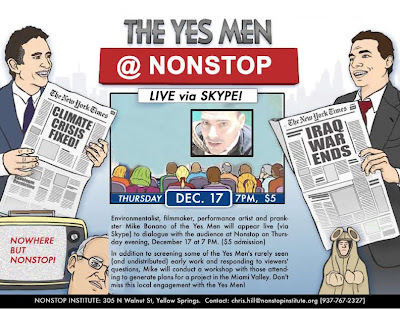 Environmentalist, filmmaker, performance artist and prankster Mike Bonano of the Yes Men will appear live (via skype) to dialogue with the audience at Nonstop on Thursday evening, December 17 at 7 PM ($5 admission) at 305 N. Walnut St. (in the Millworks complex). In addition to screening some of the Yes Men's rarely seen early work and responding to viewers' questions, Mike will conduct a workshop with those attending to generate plans for a project in the Miami Valley. Don't miss this local engagement with the Yes Men! Mike Bonano is one of the artist-activist Yes Men, who wrote, produced, and performed in the film The Yes Men Fix the World (2009). Recent Yes Men projects include last year's publishing and distribution of a special issue of The New York Times with headlines that the Yes Men and their collaborators wanted to see. The always provocative Yes Men have focused their creative actions in recent years on corporate irresponsibility in response to environmental disasters such as the catastrophic contamination in Bhopal, India as well a critique of lobbyists and organizations who refuse to recognize climate change as an impending global crisis. The Yes Men have also challenged governmental neglect in the current housing crisis in New Orleans.